The Matan LED pendant light from Tech Lighting features a slim artisan molded glass shade treated with a special mirror like coating to create two stunning visual effects. First, when illuminated the partially opaque shade provides a shielded glimpse of the retro-inspired, fully dimmable LED lamping within. Second, when not lit the shade’s subtle opacity disappears as its outer surface resembles chrome-plated metal. For added dimension, the lower section of each shade includes a series of organically flowing rings created by a delicate etching process. Whether used alone or in conjunction with coordinating Matan Grande pendant lights, Matan wall sconce lights or Matan ceiling lights, this versatile contemporary pendant light is a great choice for kitchen island lighting, dining room lighting, or living room lighting. Rated for (1) 40 watt max. E12 medium base lamp (Lamps Not Included). 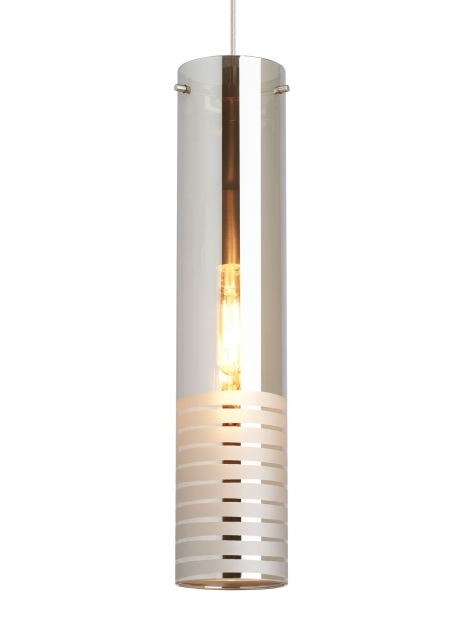 LED version includes 2 watt, 155 delivered lumen, 2700K, E12 base LED vintage tubular lamp. Dimmable with most LED compatible ELV and TRIAC dimmers. Ships with 6 feet of field-cuttable cable.